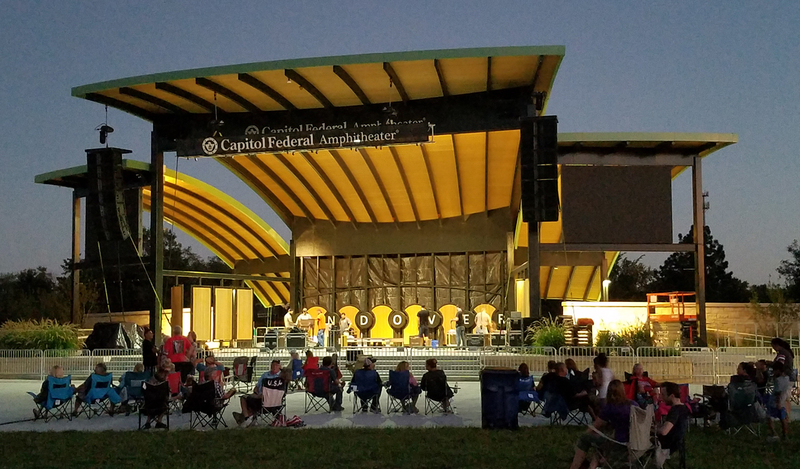 The City of Andover retained LK Architecture to design the areas first amphitheater to support their ongoing yearly concert as well as additional musical and entertainment events. 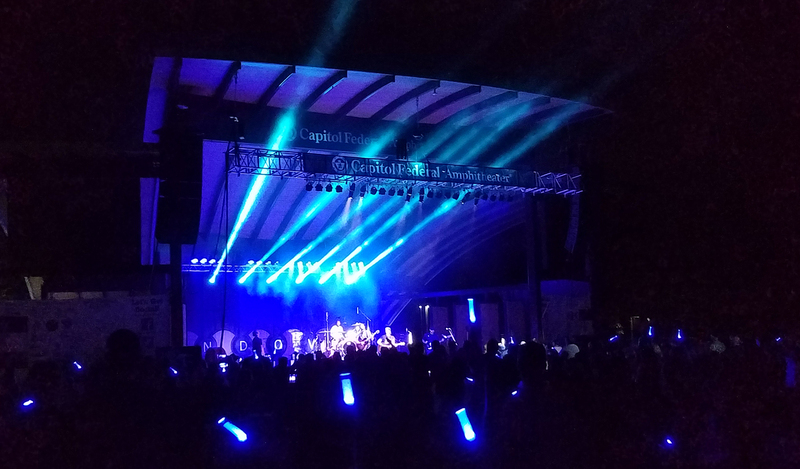 The city had held a large concert over the previous five years and desired a more formal venue with permanent stage structure. LK Architecture worked closely with the City’s steering committee through a series of workshops to explore design concepts and alternatives to location, orientation and overall design. Through this process, a new location and orientation of the stage and amphitheater was selected which created a true bowl and organized the park elements to create an overall continuity between parking areas, existing restroom/playground and park lodge. This layout also created an opportunity to create a new patio adjacent to the lodge to be used as a VIP area during concerts but also supports the leasing of the lodge for private events. The audience area is designed for crowds of various sizes. The area directly in front of the stage is paved and is planned to seat approximately 400 spectators. Beyond is a level turf area which seats an additional 1000-1200 people. The sloped “bowl” which rises five feet will accommodate and 2,000 people. For the largest events, additional area above the bowl will seat between 5,000 and 6,500. The stage and structure design is symmetrical with side stages and a main stage under a toroidal roof structure. This unique form gives the structure a unique form while aids in projecting sound towards and audience. An additional feature which aids with the acoustics of the structure are custom, curved pivoting panels on either side of the main stage. These panels can be rotated to aid in sound projection and can also be utilized to conceal side stage activities. 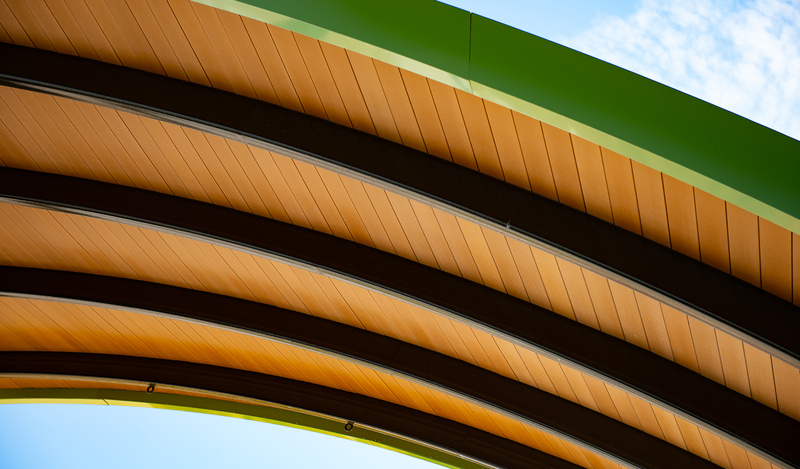 The underside of the structure is finished with composite wood decking which warms the space and speaks to the park environment while the rood is a verde-green TPO material which compliments the roofs on the adjacent library and city hall. Along the rear of the stage is a custom panel system concealing back-of-house activities while providing branding opportunity and views of the park. The stage is also serviced by a 40’ wide dock and staging area concealed by stone-veneered walls. The structure was designed for flexibility to allow for various types of shows and events. Numerous pick points and ties downs were provided for theatrical trusses, curtains, speaker towers and monitors. Two- 400 amp company switches have been provided to power show lighting and sound systems. 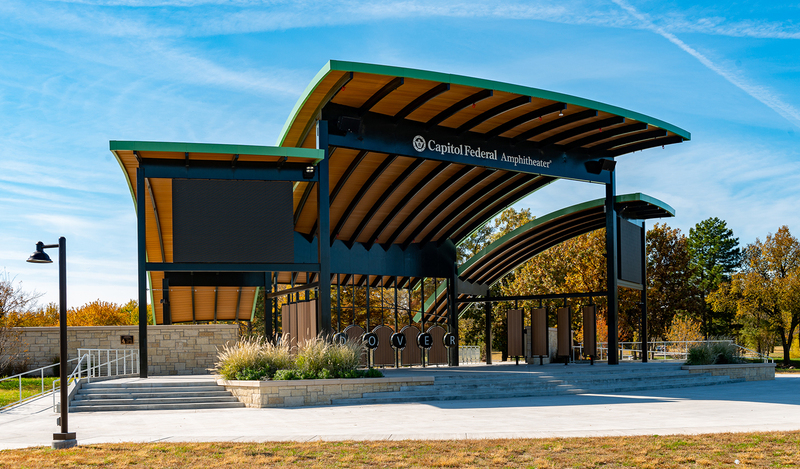 Since completion of the design, Capitol Federal has been named the event sponsor changing the name to the “Capitol Federal Amphitheater”.